Ferrara, protected by its strong walls, welcome its visitors and the charm of its historic city centre and its jealously guarded food&drink tradition fascinate everyone. Ferrara lays to the side, in a secluded corner of Italy, not far away from Venice, where the Middle Ages and the Renaissance managed to establish a dialogue thanks to the longevity of a family, the Estensis. For as many as three centuries, since 1200, the Estensis turned the city centre into one of the main European Capitals of culture. Two hearts, one soul, and this harmonious beauty was praised and celebrated by Unesco in 1995. Wandering around the city, the streets lets us breath an air of authentic flavours. Among the irregular beauty of the streets of the ghetto, you get human-size glimpses, ideal for a stroll or for some time in contemplation. Today as yesterday, people of Ferrara meet at the foot of the Romanesque-Gothic Ferrara Cathedral and of the Town Hall and talk about art, culture, food or politics, while the University students fill up the streets with their voices and dreams about the future. Not far off stands the imposing Este Castle, symbol of the city. The central squares neaten the medieval irregularity of the streets, framing the main street markets, first of all the “listone” in Piazza Trento Trieste, and the main city events, like Ferrara Sotto le Stelle, the Buskers festival or the annual festival of the review Internazionale. A swarm of bikes run along the four cardinal axes reaching the city walls, that are perfectly preserved and practicable still today. The wide urban gardens are the perfect background to such majesty. Artistic treasures sprinkle the urban pattern everywhere: the amazing cycle of frescoes in Palazzo Schifanoia are a true journey inside the 5th-century painting, while Casa Romei is a clear example of Renaissance aristocracy house. There is far more to visit: the monastic complex of San Antonio in Polesine, the Basilica of San Francesco and the suggestive Via delle Volte, the Piazza Ariostea and the prospective modernity of the avenue Ercole d’Este with its aristocratic complexes, among them the well-known Palazzo dei Diamanti, seat of art exhibitions famous all over Italy. Ferrara fascinates everyone, silently: the spaces between one monument and the next one, the long strolls through its quarters, the artworks of intellectuals and artists of every age and the food, with its proud cuisine, and its traditional Coppia, a sourdough bread made of this city a magical place. Some of the most important cultural places of the city are easily accessible thanks to the tourist card myFE (such as the imposing Este Castle, the Palazzo Schifanoia and the Palazzina Marfisa d’Este). Moreover, the card grants you admission to a long list of museums: the National Art gallery inside the Palazzo Diamanti, the majestic archaeological museum inside Palazzo Costabili (free admission every first Sunday of the month), the Cathedral Museum hosting works of art by Cosmè Tura, and the recent MLB Home Gallery, a contemporary art gallery hosted in the private home of the curator. Don’t forget the city centre, a monument by itself: over the centuries it maintained almost unconverted its historical features: its imposing façades, the alleys, the churches and the fascinating glimpses immersed in the winter fog turn the city into a melancholic and suggestive artwork. Further places you should visit are “Al Brindisi”, the world’s oldest inn, mentioned even by Ariosto in his work Lena; the cemetery of the Cherterhouse, the church Santa Maria in Vado and any of the many of cinemas or restaurants spread through the city centre, monuments of a century-old tradition and of good food. Ferrara, born from the Po River rather than from the Adriatic Sea, and its territory have always been marked by the awkward presence of this river. These places are dominated by something magical and mysterious, where man and nature have always been in conflict. These conflicts led to invaluable treasures that were the starting point for art, nature and, once again, good food itineraries. 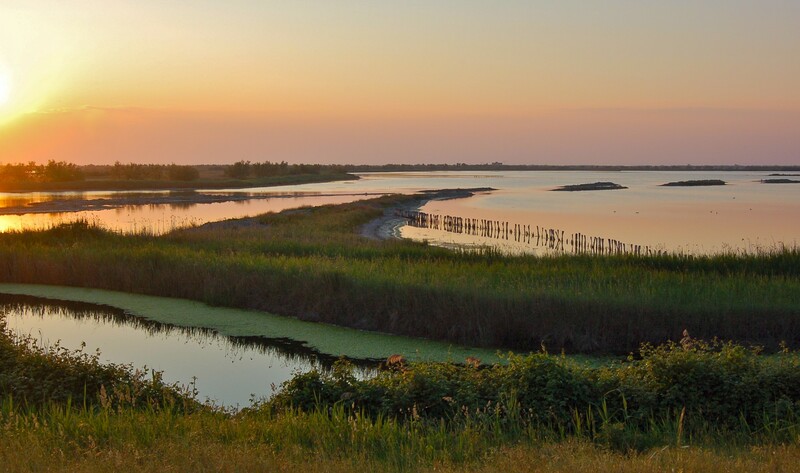 However, the beating heart of Ferrara remains the Delta Po valley, one of the most important Italian ecosystems, also recognised as World Heritage. The possible itineraries seem to be endless and the beauty of this place is indescribable. The monumental Abbey of Pomposa, built between the 5th and 6th century, or one of the many “amusement houses” called Delizie, built by the Estensis between the 15th and 16th century (Belriguardo in Voghiera, Del Verginese in Portomaggiore or the Mesola Castle) are all traces of an old splendour, in balance between nature and beauty that evoke a sensation of infinite wonder. The International Airport of Bologna Guglielmo Marconi is about 53km-highway away from Ferrara, you can reach it in 45 minutes, travelling also on shuttle buses or by car. The shuttle bus service Ferrara Bus&Fly is available all year round. You can reach Ferrara by car taking the highway A13 that connects Bologna with Padova, passing through Rovigo, and that connects with the rest of the Northeast Italy (www.autostrade.it). SS64 Porrettana crosses diagonally the Emilia Romagna and connects Ferrara with the Upper Toscana. The SS 16 Adriatica and the SS 309 Romea, on the other hand, connect Ferrara with Ravenna and the heart of Romagna. Finally, the interchange Ferrara-Porto Garibaldi cuts Ferrara from West to East until the Adriatic Sea. The Bologna-Padova line connects Ferrara with the main cities of Northeast Italy. Italia: www.trenitalia.it. Here are the stops also of the Ferrara-Codigoro line, the Suzzara-Ferrara line (www.fer.it) and the Ravenna-Rimini line.